Do your shopping at Museu Calouste Gulbenkian and A Arte da Terra. Jeronimos Monastery and Shrine of our Lady of the Rosary of Fatima will appeal to history buffs. Venture out of the city with trips to Cabo da Roca (in Colares), Evora (Templo Romano de Evora (Templo de Diana) & Capela dos Ossos) and Batalha Monastery (in Batalha). There's still lots to do: explore the historical opulence of Castelo de S. Jorge, steep yourself in history at Castelo dos Mouros, explore the world behind art at National Tile Museum, and wander the streets of Alfama. To see reviews, traveler tips, where to stay, and tourist information, use the Lisbon trip itinerary builder . Sao Paulo, Brazil to Lisbon is an approximately 14-hour flight. You can also do a combination of bus and flight. The time zone difference moving from Brasilia Time to Western European Time is 3 hours. Prepare for slightly colder weather when traveling from Sao Paulo in March: high temperatures in Lisbon hover around 20°C and lows are around 10°C. Finish your sightseeing early on the 11th (Mon) to allow enough time to travel to Bath. The Roman Baths and Blenheim Palace will appeal to history buffs. You'll explore and learn at The Tank Museum and Brunel's SS Great Britain. Explore the numerous day-trip ideas around Bath: Wells Cathedral (in Wells), Weymouth Beach (in Weymouth) and Salisbury Cathedral and Magna Carta (in Salisbury). There's lots more to do: contemplate in the serene atmosphere at Bath Abbey, sample the fine beverages at Cotswolds Distillery, and browse the eclectic array of goods at Pulteney Bridge. To see where to stay, ratings, reviews, and more tourist information, refer to the Bath day trip planning tool . Do a combination of flight and bus from Lisbon to Bath in 6 hours. Alternatively, you can do a combination of flight and train; or do a combination of flight, bus, and train. Finish your sightseeing early on the 15th (Fri) so you can drive to Portsmouth. Portsmouth is a port city and unitary authority in the ceremonial English county of Hampshire and is located south-west of London and south-east of Southampton. Your inner history buff will appreciate Osborne House and Portsmouth Historic Dockyard. Do some cultural sightseeing at The Lanes and North Laine. Get out of town with these interesting Portsmouth side-trips: Bournemouth Beach (in Bournemouth) and Royal Pavilion (in Brighton). The adventure continues: see the interesting displays at The Mary Rose Museum and get engrossed in the history at HMS Warrior 1860. For where to stay, other places to visit, maps, and tourist information, read Portsmouth trip builder tool . You can drive from Bath to Portsmouth in 2 hours. Alternatively, you can take a train; or take a bus. In March, plan for daily highs up to 11°C, and evening lows to 3°C. Finish your sightseeing early on the 18th (Mon) to allow enough time to drive to London. Appreciate the collections at National Gallery and The British Museum. You'll discover tucked-away gems like Dover Castle and St. Mary The Virgin Church. The adventure continues: take an in-depth tour of Natural History Museum, take in panoramic vistas at Coca-Cola London Eye, admire the striking features of Houses of Parliament, and explore the world behind art at Victoria and Albert Museum. For ratings, more things to do, and other tourist information, go to the London sightseeing tool . You can drive from Portsmouth to London in 1.5 hours. Alternatively, you can take a train; or take a bus. In March, daily temperatures in London can reach 11°C, while at night they dip to 3°C. Wrap up your sightseeing on the 23rd (Sat) early enough to take a train to York. York City Walls and Fountains Abbey will appeal to history buffs. Explore hidden gems such as York Castle Museum and Whitby Abbey. When in York, make a side trip to see Filey Beach in Filey, approximately 1h 15 min away. There's still lots to do: examine the collection at York's Chocolate Story, make a trip to York Shambles, and contemplate in the serene atmosphere at York Minster. To find photos, more things to do, traveler tips, and more tourist information, go to the York tour itinerary planner. You can take a train from London to York in 2 hours. Alternatively, you can do a combination of flight, bus, and train; or drive. In March, daily temperatures in York can reach 11°C, while at night they dip to 1°C. Cap off your sightseeing on the 26th (Tue) early enough to catch the train to Alnwick. Alnwick is a relatively large market town in north Northumberland, England, of which it is the county town. Shop till you drop at Julie Dumbarton Fine Art Painter and Mary Ann Rogers Gallery. Get some historical perspective at Lindisfarne Priory and Cragside House and Gardens. Explore Alnwick's surroundings by going to Norham Castle (in Norham) and Bamburgh Beach (in Bamburgh). There's much more to do: explore the historical opulence of Bamburgh Castle, see the interesting displays at Grace Darling Museum, take in the architecture and atmosphere at The Parish Church of Saint Peter, and stroll through The Alnwick Garden. To find more things to do, where to stay, reviews, and tourist information, read our Alnwick road trip site . You can take a train from York to Alnwick in 2 hours. Other options are to drive; or do a combination of train and bus. In March, daily temperatures in Alnwick can reach 9°C, while at night they dip to 2°C. Finish your sightseeing early on the 30th (Sat) to allow enough time to take a train to Edinburgh. Edinburgh Castle and The Riverside Museum of Transport and Travel are good opportunities to explore the local culture. Eschew the tourist crowds and head to Stirling Castle and Royal Botanic Garden Edinburgh. Explore Edinburgh's surroundings by going to Rosslyn Chapel (in Roslin) and Buchanan Street (in Glasgow). Next up on the itinerary: see the interesting displays at National Museum of Scotland, take in the architecture and atmosphere at St Giles' Cathedral, explore the galleries of Royal Yacht Britannia, and explore the historical opulence of Palace of Holyroodhouse. To find photos, traveler tips, more things to do, and tourist information, read our Edinburgh trip maker . Traveling by train from Alnwick to Edinburgh takes an hour. Alternatively, you can drive; or take a bus. In March, plan for daily highs up to 9°C, and evening lows to 1°C. Wrap up your sightseeing on the 3rd (Wed) early enough to travel to Ullapool. Ullapool is a village of around 1,500 inhabitants in Ross-shire, Scottish Highlands. Head to RhueArt and An Talla Solaisfor some retail therapy. Visit Polin Beach and Scourie Bay for some beach relaxation. Explore the numerous day-trip ideas around Ullapool: Red Point Beach (in South Erradale), Lotte Glob (in Durness) and Russian Arctic Convoy Museum (in Gairloch). There's still lots to do: explore the historical opulence of Eilean Donan Castle, enjoy the sand and surf at Clachtoll Beach Campsite, stroll through Sandwood Bay Beach, and explore the ancient world of Brochs at Glenelg - Dun Telve & Dun Troddan. To find ratings, other places to visit, where to stay, and tourist information, you can read our Ullapool trip itinerary maker app . You can drive from Edinburgh to Ullapool in 4.5 hours. In April in Ullapool, expect temperatures between 12°C during the day and 2°C at night. Wrap up your sightseeing on the 8th (Mon) to allow time to travel to Inverness. Visit Urquhart Castle and Fort George for their historical value. Appreciate the collections at Picaresque Books and Tarbat Discovery Centre. You'll find plenty of places to visit near Inverness: Glenfarclas Distillery (in Ballindalloch), Gallery48 (in Cromarty) and Nairn Beach (in Nairn). There's lots more to do: witness the site of a historic battle at Culloden Battlefield, get a taste of the local shopping with Scottish Flair Art Gallery, view the masterpieces at Castle Gallery, and stop by Seaweed n Stuff. To see traveler tips, photos, and more tourist information, read our Inverness holiday maker website . You can drive from Ullapool to Inverness in 1.5 hours. Expect a daytime high around 13°C in April, and nighttime lows around 2°C. Cap off your sightseeing on the 13th (Sat) early enough to go by car to Isle of Skye. We've included these beaches for you: Sound of Sleat Beach and Bearreraig Bay. You'll discover tucked-away gems like Trotternish Art Gallery and Skyelark. There's lots more to do: explore the ancient world of Dunscaith Castle, take in the exciting artwork at Uig Pottery, explore the striking landscape at Quiraing (Hill Walk), and contemplate the long history of Dun Beag Broch. To see ratings, reviews, photos, and tourist information, go to the Isle of Skye trip planner . Getting from Inverness to Isle of Skye by car takes about 3.5 hours. Other options: take a bus; or do a combination of train and taxi. In April, daytime highs in Isle of Skye are 11°C, while nighttime lows are 4°C. Wrap up your sightseeing on the 18th (Thu) to allow time to travel to St. Helier. Jersey War Tunnels - German Underground Hospital and Elizabeth Castle are good opportunities to explore the local culture. Head to Jane James Handmade Ceramics and The Harbour Gallery Jerseyfor some retail therapy. You'll find plenty of places to visit near St. Helier: St Peter Port (The Guernsey Tapestry & Castle Cornet) and The Little Chapel (in Les Vauxbelets). For maps, other places to visit, more things to do, and more tourist information, go to the St. Helier day trip planner . Do a combination of bus and flight from Isle of Skye to St. Helier in 8 hours. Alternatively, you can do a combination of car and ferry; or do a combination of bus, taxi, and ferry. April in St. Helier sees daily highs of 15°C and lows of 7°C at night. Cap off your sightseeing on the 23rd (Tue) early enough to travel to Cannes. Deepen your sense of the past at sights like La Croisette and Villa & Jardins Ephrussi de Rothschild. Do some cultural sightseeing at Rue d'Antibes and Palais Lascaris. You'll find plenty of places to visit near Cannes: Nice (Museum of Modern and Contemporary Art, Vieille Ville, & more), Ruines de Chateauneuf Villevieille (in Chateauneuf-Villevieille) and Eglise Saint Jean Baptiste (in Coaraze). There's still lots to do: take in the architecture and atmosphere at La Madone d'Utelle, shop like a local with Verrerie Pierini, view the masterpieces at Galerie Gabel, and appreciate the extensive heritage of Saint-Paul de Vence. For reviews, other places to visit, maps, and other tourist information, use the Cannes trip itinerary app . You can do a combination of flight and train from St. Helier to Cannes in 6 hours. Alternatively, you can do a combination of ferry and car; or do a combination of ferry and bus. The time zone difference when traveling from St. Helier to Cannes is 1 hour. 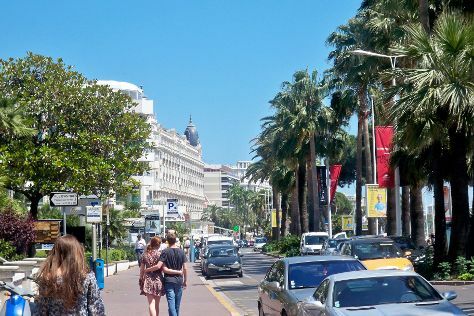 Traveling from St. Helier in April, expect nights in Cannes to be about the same, around 10°C, while days are somewhat warmer, around 22°C. Cap off your sightseeing on the 28th (Sun) early enough to travel to Madrid. Visit The Walls of Avila and Plaza Mayor for their historical value. Eschew the tourist crowds and head to Alcazar de Segovia and Segovia Aqueduct. Step out of Madrid with an excursion to Cathedral of Avila in Avila--about 1h 40 min away. There's lots more to do: see the interesting displays at Prado National Museum, admire the landmark architecture of Royal Palace of Madrid, explore the world behind art at Monasterio de las Descalzas Reales, and contemplate the waterfront views at Retiro Park. To find photos, more things to do, other places to visit, and other tourist information, you can read our Madrid day trip planning website . You can do a combination of train and flight from Cannes to Madrid in 5.5 hours. Other options are to do a combination of train and flight; or drive. In April, plan for daily highs up to 22°C, and evening lows to 9°C. Wrap up your sightseeing by early afternoon on the 3rd (Fri) to allow enough time to travel back home.